The first hike we want to highlight for Spring is an epic experience in the canyons of Arizona. 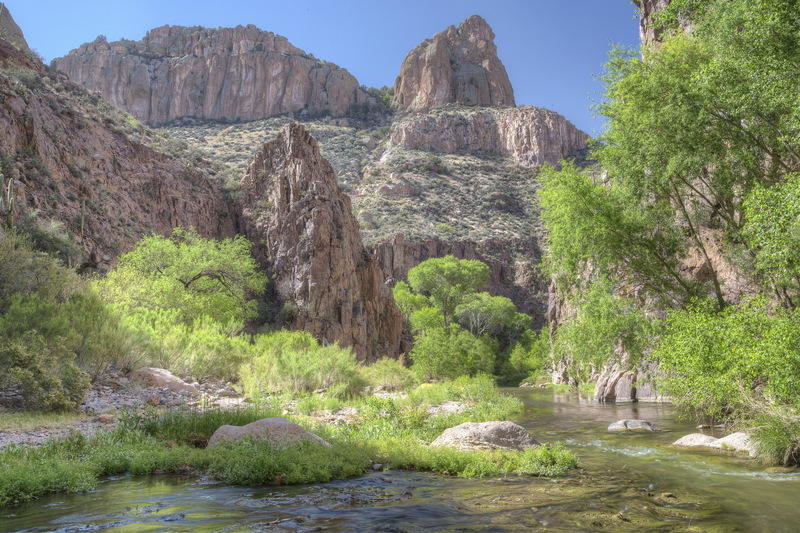 Have you heard of Aravaipa Canyon Wilderness? If you have, good on you. If not, it’s definitely worth a day hike or overnight. Just an hour and half drive northeast of Tucson, or two and half hours southeast of Phoenix, the Aravaipa Canyon Wilderness is an 12 mile stretch of walkable wilderness, where you’ll trek through sand banks, across rivers, and explore a number of side canyons. There are some basics to know about hiking in Aravaipa Canyon Wilderness. You need a permit for a day hike or an overnight n in the wilderness. This is a popular site (though not as popular as, say, Yosemite or the Grand Canyon), so make sure to plan in advance. Grab your permit through Recreation.gov — at the time of writing you can book spots about 3 weeks out. All of our references will be for the OW West Entrance — this is much easier to access due to its proximity to Tucson and Phoenix, a road that most vehicles can go on, and a more pleasant hiking experience. The Aravaipa Canyon Wilderness has no official trails. 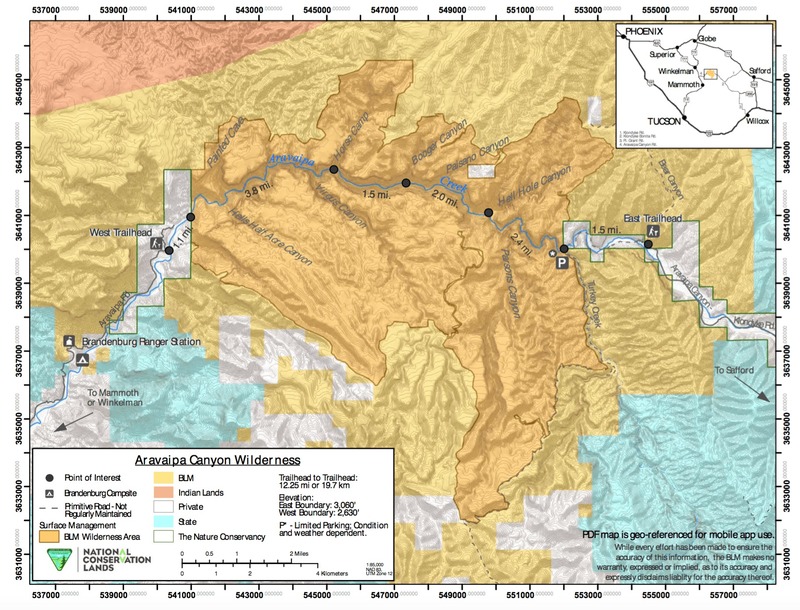 You hike in, meet up with Aravaipa Creek, and continue due East through the canyon, stopping where and when you want. There is freedom in this model, but also a little more responsibility. Lastly, you will get wet. You have to cross the Aravaipa Creek multiple times, navigate changing sand banks, and sometimes deal with water at waist level. Prepare for wetness. Now that those particulars are cleared up, let’s dive into what makes this wilderness so appealing. The Aravaipa Creek runs year-round, something of an oddity in the desert of Arizona. As such, the types of plants and animals in the canyon are abundant and unique. Cottonwood trees line the river, while herons, turkey vultures, and hawks patrol the canyon and skies for food. There are also millipedes and scorpions, which shouldn’t bother you too much on a hike, but can get meddlesome if you’re sleeping overnight. The entire canyon is towering, red-stoned walls, which contrast starkly with the vibrant green of spring. You’ll also have ample opportunities to swim in the creek, which is sprawling at times. Really, you can hike for as long as you want. You won’t realistically be able to do the full 12-mile canyon in a single day (especially if you are trying to get back to the original trailhead), and most people will be content to either go for a nice, full day hike, or sleep over a single night. Horse Camp Canyon is a good general stopping point for either of these activities, though a day hike in and out to Horse Camp Canyon will run about 10 miles in total — and that’s wading through water and sandy banks at points — so be prepared for a haul. There are excellent camp sites at Horse Camp Canyon, and a five mile jaunt is an easy backpack. You’ll still get to see the beauty of the wilderness, and probably explore a canyon or two. Because there are no trails, it’s imperative to bring the BLM map and a GPS. You could use your phone for this, but a more dedicated GPS device would be better. Using these together you can estimate when you’ve reached the general area of Horse Camp Canyon, which forks north of Aravaipa Creek. Official BLM Site: Information about permits, a helpful video, and general information about the wilderness. Hike Arizona: The most in-depth information you’ll find on Aravaipa Canyon Wilderness. A personal hike guide gives good tips, while tons of user reviews, maps, photos, and answered questions are also available. Sirena’s Wanderings: A good (but old) article on a backpacking excursion in the Wilderness. An opinion piece with lots of pictures, videos, and good tidbits of information. Recreation.gov: Where you book your permits.